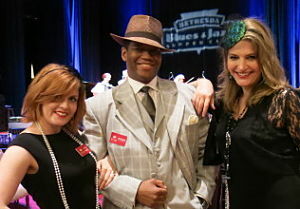 My team and I got wore vintage-inspired ensembles. When I started working with this group in 2010, the organization was moving away from a sit-down dinner. Goodbye traditional gala. Hello something new. The “something new” has changed at each event. For instance, each venue is different. Quality entertainment is hired (I’m part of this). Unique staging and props are used. The event is well-run, from registration to flow to checkout. Generally speaking, this is what I’d call a high production value event. It’s classy. There is an emphasis on ensuring elements are done well. To be clear, this isn’t high production like you might imagine the Academy Awards to be. Budgets do come into play. And it’s not high production like some of the more tony events I’ve worked both in D.C. and elsewhere. But for a smaller-sized event whose organizers wanted to shake things up, this is what I’d say is high production. It’s designed to have a “wow” effect. As this is not a sit-down affair, a good portion of people stand throughout the night. Though there are usually areas one might find to rest, only sponsors have assigned seating. Though the event has been high caliber every year, I was particularly impressed at how the group brought to life this 1930’s club. It really felt like I was walking into something from a decade gone by. Though the benefit auction theme was not specifically 1930, the date tied into a significant time in the nonprofit’s history. It worked. Take a look at these two videos and tell me what you think. This first clip was taken before guests arrived. I wanted to show you some of the classy elements brought in that recreated the club feeling, yet still managed to focus guests on the two stages. We have utilized Sherry and her excellent team at Red Apple Auctions for three fundraisers and continue to be impressed! Sherry is professional, well spoken, entertaining, and she gets the job done. Showcase 2014 was our most successful fundraiser yet – raising $400,000! Sherry’s work doesn’t begin when she steps up to the microphone; it begins months in advance with guidance on auction items, how best to market to our group, consignment items if needed, how to sell strange or high-value items, recommendations for vendors and so much more. After three events, we are also benefitting from the consistency of having the same auctioneer. Sherry understands the unique format of the event and she knows our donors – what they’ll buy, how much they will spend and even how to get their attention. All of this, and more, she puts to good use. We also appreciate Sherry’s team members who help to sell raffle tickets, solicit donors to our bid-box and assist in the live auction as spotters. 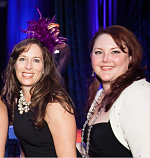 They are professional, efficient, and always look fabulous dressed in the theme of our event! Another advantage of Sherry’s years of experience is her ability to analyze results after the auction; providing guidance that will help lead us into our next fundraising event. Red Apple consistently exceeds our expectations. We wouldn’t consider using another auctioneer and look forward to working with Sherry many more times. wish I could have seen how you were able to get the attention of the audience and how the auction worked. How did you conduct the auction? How long was it? How many items? Becky, the auction had 10 items and took — between that and a Fund a Need — about 40 or 45 minutes. As far as getting their attention, it wasn’t hard. I was in the middle of the room, so everyone could see me. I’d turn to address everyone when describing items, and then turn to accept the bids as people raised their bid number. In that respect, it was a standard auction. Unlike other spaces, I did not get off the stage here. It was a bit tricky to do so, and as I was ‘in the round,’ it wasn’t necessary for that space. I have clips of myself working many auctions (though not that one), if you’ve never seen how an auction works. YouTube is another place to watch how auctions are conducted.